Ella’s Bubbles is a Chicago-Based OEM Manufacturer of High Quality Ella Brand Acrylic Walk In Bathtubs. For bathers who require maximum accessibility, an outward swing door acrylic walk-in tub is the perfect choice. With options like standard dimension Malibu acrylic walk in tub or front entry arcylic walk in tub, we offer a variety of models to suit your space. 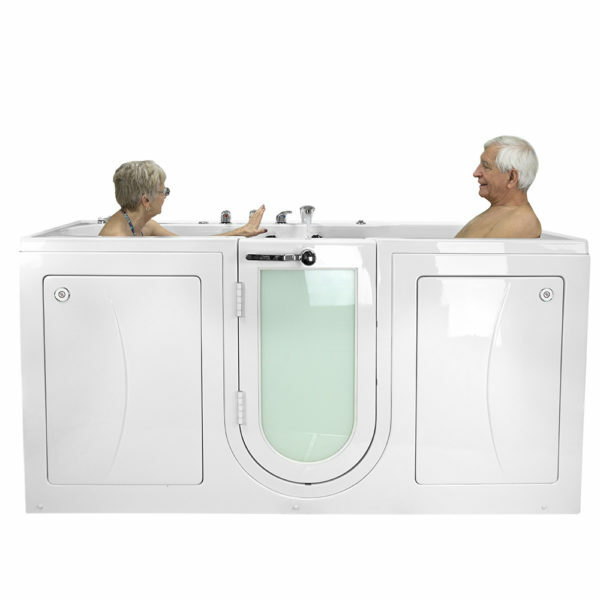 Ella’s Bubbles offer several acrylic walk in tubs that have two seats so couples can enjoy a relaxing bath together. All of our two seat acrylic walk in tubs come with a center door for convenient access and dual drain for fast and reliable drainage and exit. Ella wheelchair accessible acrylic walk in tubs are made with a high-quality gloss finish acrylic shell along with a frame-less L-Shaped door for easy access, to those needing extra space to get in and out of your walk in tub. Discover all of what Ella’s Bubbles has to offer! Fill out this short form, and we will e-mail you our walk-in tub brochures and keep you updated on all upcoming tubs! This is secure, confidential information and will be used only as pre-qualification questioner. Please answer all questions to get pre-qualified for dealer status. If you are thinking about purchasing an accessible walk in tub, feel free to call 800-480-6850 or fill out the form below for any questions or for FREE pricing info. Our nation wide authorized resellers and professional installer network can work with any bath renovation project regardless of size including institutions, hospitality industry, hotels, nursing homes, care homes, hospitals, commercial, or residential. They will work with any individual home owner to make your bathrooms more accessible to everyone. Explore the Ella brand walk-in bathtubs with features like soothing and exfoliating Infusion™ Microbubble Therapy, powerful air and hydro massaging jets, and calming aromatherapy to bring a revolutionized bathing experience into your home. Complete this form and we’ll connect you with a local dealer and installer in your area!